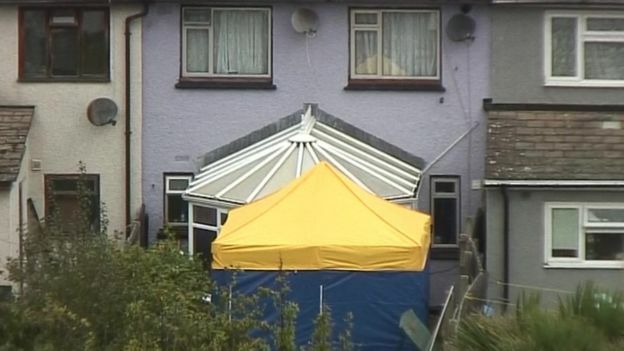 Police investigations are ongoing at a property in Sunbury-on-Thames. 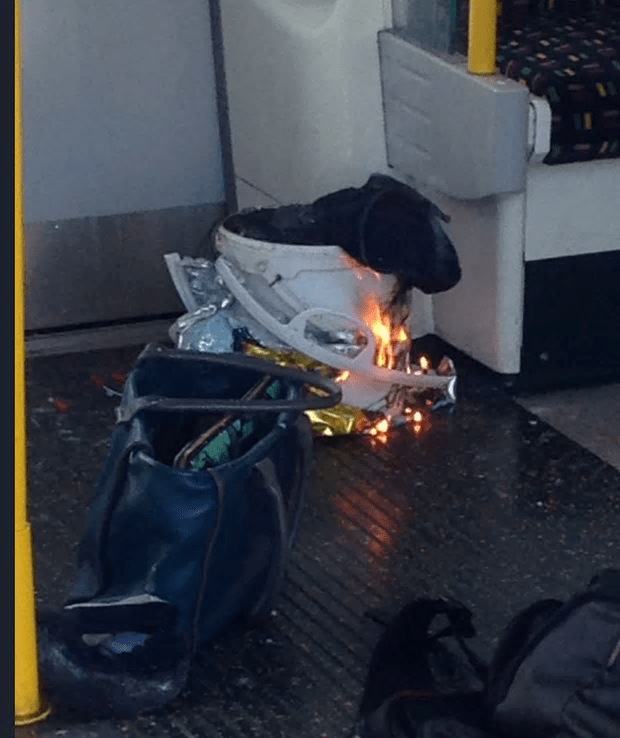 Now two people have been arrested in connection with the failed bomb attack at Parsons Green tube station – but This Writer is willing to bet that still isn’t enough to convince some of you that it was real. That would be because the bomb didn’t explode; only the detonator. 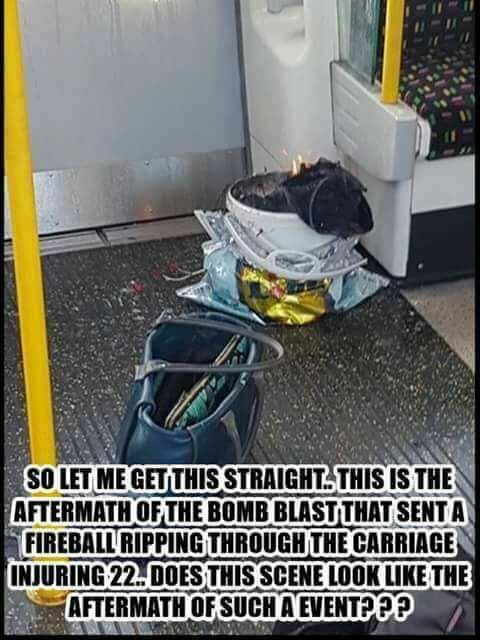 That’s why it only caused a fireball which swept through the train carriage and singed 30 people (some quite badly), rather than a conflagration that could have killed them all, along with many more. Of course the side of the handbag that would have taken any damage is facing away from the camera. Also, a fireball would have gone upwards and travelled along the carriage’s ceiling, not outwards. Finally, we have no idea when the handbag was put there; the image was clearly taken after the detonator had been triggered but beyond that we have no idea of the context. This refers to the fat that the device appeared to be in a plastic bag from the Lidl supermarket chain. Look at the image, though – it clearly wasn’t indestructible. Because the flames went upwards, not outwards, as stated previously. In response, I wrote: “No, it’s the aftermath of a FAILED bomb. It didn’t go off, remember? The fireball was from the detonator. If the bomb had gone off, there would have been a LOT more damage and your sarcastic little meme would be in extremely poor taste. Seriously, have a think about what has actually happened before posting nonsense like this. The nonsense goes on and on. One commenter compared a victim being walked away from the site with a bandage around her head with someone dubbed a “crisis” actress – but the resemblance was only superficial. It was not the same person. Of course we don’t know anything of the sort and there is no evidence to suggest that our own security services took part in an attack on innocent UK citizens, which would be a contradictin of their own purpose. What do the people who were injured have to say? Here’s some sense from another commenter: “I think the facts must come from the people who were there. There WERE some serious burns, one man lost hair from the top of his head and his scalp was burned, on the initial interviews there were people with bandages on their heads and hands and burned clothing. The flames travelled down the carriage at roof level according to what I heard, and a lot of people will have ducked down which would be the natural response and would have been shielded by others less lucky. The overwhelming chorus from the ‘false flag’ brigade is that the attempted bomb was a bid by the minority Conservative government to attack what’s left of our civil liberties. But there’s one big problem with that: We already know that the UK’s ability to detect planned terror attacks has been whittled away by Theresa May and the minority Conservative government. There should be no support for any attempt to remove our remaining civil liberties because it would be the wrong response by this government to a situation for which this government is responsible. In short: It is irrational to support oppressive measures proposed by a government to stop an emergency that it has created. The ‘false flag’ brigade should think about that before parading their ignorance across the Internet. There is another aspect to this story that has been seized and perverted by the ‘false flag’ people – the claim that the first man to be arrested had formerly been fostered by a couple who had looked after hundreds of children, including refugees. The claim is that MI5 had radicalised this 18-year-old in some way. This Writer is keen to know how that is supposed to work. It seems more likely that, as a refugee, this person was recruited after leaving the care of Roger and Penelope Jones, but I’ll stand corrected if I have to. I suspect I’ll be waiting for confirmation of the story for a very long time. A second man has been arrested in connection with Friday’s attack on a London Tube train, police said. Home Secretary Amber Rudd told the BBC that the second arrest suggests the attacker was not “a lone wolf”. Police are searching a residential address in Stanwell, Surrey, in connection with the 21-year-old man’s arrest. Whether the bomb was a ‘false flag’ or not is not, in my opinion, the main issue.. The whole debate raises the question about the level of mistrust and the lack of faith in the honesty of this government. Now that is the question that needs to be addressed, how did we, as a society, get to that point? ‘straight out of the tinfoil hat’ ? Dear me ..are you trying to suggest those who disagree with you are strangely not ‘compos mentis’? Because strangely enough this is what you are accused of often and I defend you…. often! There will always be people who wish to create facts to support their theories, the main problem is who is creating facts that are not true and who is using facts that are true. Most people will not have a clue which are right and which are wrong and to make it even more complicated people could be using a mixture of correct and incorrect facts. Neither side or sides will be interested in believing the others. Governments and their controlling forces have in the past and will do in the future commit some atrocious acts just to prove their points. History to some degree proves this as some facts will be whitewashed from records if the ruling forces so wish and then could input some false information, but in any way historical information may be distorted, only to be revised when new forces take over. But who is to say if the new forces will be inputting false or true history. We are all at the mercy of who is recording what and how much they will be truly accurately recording or not. So you believe who you wish to and hope for the best. For the Government of the day to create situations for their own means is taking a big risk, especially in this age of social media and the consciences of the people within the areas of Government, what with so many leaks of information which are occurring. So I tend to believe what is being officially being reported, but at the same time keep an open mind. I feel like a bit of an expert witness here. When I was a young man, a bit of foolishness exposed me to flash burns in a room full of soft furnishings. The fireball was short-lived and about 4-5 foot across. According to eyewitnesses, the heat was prodigious and from outside the room lit up like a firework. NONE of the furnishings in the room were remotely damaged, but I spent a night in the Yorkshire Regional Burns Unit under observation. My hand was bandaged for a fortnight and my face subsequently peeled like Fr Dougal Macguire’s on a foreign holiday. No part of my body covered by clothing was affected and my clothes were unburned. I walked away from the incident and no substantial pain kicked in for 20-30 minutes, although I should add that 1 hour in as I was waiting for the pethidine to kick in, I felt like sobbing. It strikes me that most of the conspiracy theorists have little or no experience or empathy. Bandaged walking wounded are entirely consistent with this sort of botched attempt at murder. Tube trains are pretty robust, putting up, as they do, with thousands of Londoners a day. Human skin is most definitely not. Conspiracists might want to try an experiment: try and singe a piece of plastic with a match and note the time it takes. Then they might want to hold their finger there for the same amount of time. Once you’ve noted the effects, come back to me with your conspiracy. Well done – a decent article. Well I know it wasn’t faked, however to describe it as a bomb? It looks like the makings of a flashbang, which can seriously injure anybody in close proximity, but their sole purpose is to cause panic. Given that fear is the Terrorist weapon of choice, it achieved its goal. this is one excellent raison to employ guards on all trains.and conductors on buses. Obviously, this was a real event, not a hoax. I haven’t heard anyone seriously suggest that it was completely faked, with actors etc, or maybe I just don’t tune in to such idiocy.